If situated in the right place, maintenance requirements are minimal. Consistent watering and a good layer of mulch fortify evergreen trees and during the winter months helps prevent injury caused by the drying effects of wind and sun. On-going maintenance would be occasional fertilizing and shaping will keep them green and well-formed. So if you’re looking for year-around beauty in your garden, think about adding evergreens to the landscape. It’s essential to plant evergreens where the possibility of drying out in the winter is diminished. Though their foliage has a waxy coating that helps conserve water, winter sun and wind can dry them out, taking moisture from the plant. Most evergreens favor full sun in the summer and shade in the winter. Though it sounds contrary, winter burn can be an issue. It can be possible to fulfill both requirements by planting them on the north side of the property. They would prefer to be planted in well-drained soil with slightly acidic soil conditions. Soil moisture should be sustained for evergreens to endure winter or drought conditions. A thick layer of mulch with coarse wood chips or shredded bark will reduce the loss of moisture from the soil. Consider working in organic matter or compost to add nutrients. Be diligent about ensuring the plant is watered during dry stretches in the summer and fall and if you live in a temperate climate continue to water in the winter months as well. Typically evergreens don’t need as much feeding as deciduous species, but if new growth is slow or the color and size of the foliage isn’t standard for the species, fertilizing could be advantageous. Use a fertilizer that will add more nitrogen than phosphorus or potassium. Feeding should be done between early April and mid-summer by following recommendations for the product. After July, only a slow-release fertilizer should be applied. If you are experiencing drought conditions, don’t fertilize but do continue to water on a consistent basis. Most evergreens typically only require light corrective pruning when there is a need to eliminate dead or damaged branches. You should not prune in late summer and early fall because this may encourage new growth that won’t have time to harden before cold weather. Pines are probably the most prominent of evergreen tree types. While most of them have long, needlelike foliage and are cone bearing, not all in this family of trees are the same. Each one will have their own distinctive characteristics. Some of the most popular varieties include: white pine, pinyon pine, red pine, and Scotch pine. Spruce trees feature striking short needles and hanging cones and they also make a terrific addition for year-round beauty in the yard. 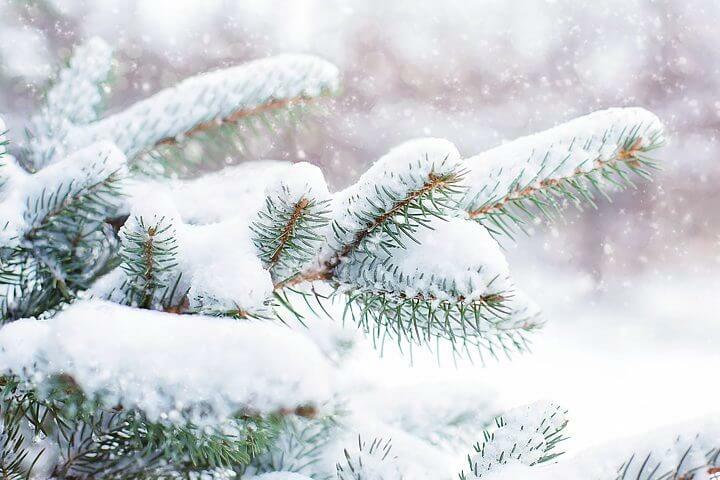 Popular choices to consider include: Norway spruce, Colorado blue spruce and white spruce. Fir trees are beautiful for specimen plantings and have interesting erect cones. Some of the most commonly sought-after firs include: Douglas fir, white fir, and Fraser fir. If your yard doesn’t permit the addition of a large evergreen tree you can still get year-round beauty from evergreen shrubs. Many have lovely flowers when there’s not much else colorful in the garden. Several varieties offer variegated foliage for an additional pop of color and all offer interesting texture. There are many to choose from but here are a few unique plants that may appeal to you. Daphne is a wonderful small evergreen shrub that would fit into any garden. It has a rounded habit and unique glossy yellow lined leaves. This versatile shrub will delight you with its large leaves on upright stems. It is a very exotic looking plant that bears creamy white flowers and is very attractive to honey-producing bees. This may be the most well-known evergreen shrub. The dark glossy foliage and bright red berries make it a standout at Christmas but it adds year-around beauty as a hedge plant or part of a mixed border. Whether you choose to plant evergreen trees or smaller shrubs after just one season you will agree that these delightful plants are a welcomed addition to your landscape. Have fun planning now and then enjoy them year-round.